1940 LUNDY RED CROSS ½, 1, 2 and 3 Puffin issue on envelope to Sutton Coldfield showing AIR SERVICE TO LUNDY/SUSPENDED/FOR DURATION OF WAR. VERY SCARCE. 1841 Envelope from Guernsey "per Private Steamer Southampton" to East Bergholt "via Manningtree" with, on the reverse, a SOUTHAMPTON/SHIP-LETTER, Robs S 10. 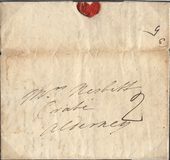 1865 1d Rose-Red, SG 43, Plate 72, tied to Mourning envelope to 'Mountjoy Barracks, Phoenix Park, Ireland' by a JERSEY '409' duplex and sent by 'H & K PacT.'. 1943-4 Envelope from ALDERNEY CONCENTRATION CAMP addressed to PARIS. RARE. A short explanation of Concentration Camp Mail is included. 1858 Envelope addressed to London from the ISLE OF MAN showing a FINE ST. JOHNS UNDATED CIRCLE. Carried by Direct Bag Mail to Liverpool where a 1d Rose-Red, SG 40, was affixed and cancelled by a Liverpool '466' numeral. 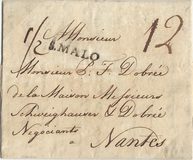 1843 Entire headed "Ballacragga" sent unpaid to Douglas showing a very fine ISLE OF MAN HANDSTRUCK '2' POSTAGE DUE, IM 67, W 28, Type 30e. The reverse flap shows a two-line CASTLE/TOWN and a feint "DOUGLAS I.M." Skeleton cds. 1824 "ON HIS MAJESTYS SERVICE' 'FREE' entire addressed "To the Right Honorable the Pay-Master General of His Majestys Land Forces, London"; affadavit from a Chelsea Pensioner in Douglas, I.O.M. showing A SUPERB straight line ISLE OF MAN (small "OF"), IM 11, W9, 40 x 4 mm. RARE. 1825 Cover and part letter addressed to the Bible Society, Blackfriars, London, showing a fine TYPE 1 "JERSEY." SCROLL JC4. London Inspector's Crown on the front changing the rate from '1/1' to '2/2'. 1847 3 October Large part cover from Jersey to Granville via St Malo showing very fine ILES-C/ST MALO circular datesyamp and handstruck "3", both in red. Postage due 5 decimes - 3 dec Channel Islands to France + 2 dec local postage (charged as though landed at Granville), CF 38. Ex Jay. 1805 Pair of Covers from London to THE FORWARDING AGENT "MR ROBILLIARD AT WEYMOUTH", ONE RATED 9d, 10d and 1/-, THE OTHER RATED 1/6d, 1/7d and 2/-. 1940 Censored envelope to Cork franked by Lundy ½d Crimson Pair and ½ Puffin tied by "AIR SERVICE TO LUNDY/SUSPENDED/FOR DURATION OF WAR". Scarce. 1808 Entire from Castletown, IOM addressed to Chester showing a very fine HORSESHOE ISLE OF MAN, IM 3.